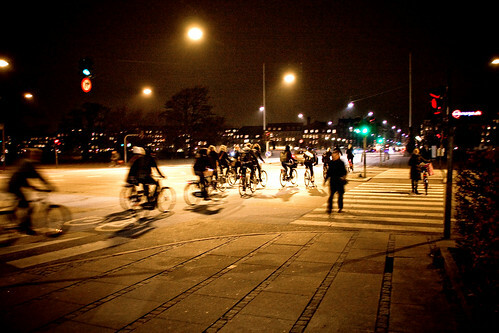 Friday night bicycle traffic in Copenhagen. The European Cyclists Federation [ECF], present here in Copenhagen for the conference, sent a letter to all the members of European Parliament's delegation to the Climate Conference. It is short and sweet and to the point. Urban traffic is responsible for 40% of CO2 emissions. Transport is part of the problem. Cycling is part of the solution. would save 49.1 million tons of CO2 or 5% of CO2 transport emissions. [*] See The Charter of Brussels. You can read the letter to the MEPs here, as a pdf. Brilliant. The European Cyclists’ Federation was founded in 1983 by 12 bicycle user associations. It has now 60 member organizations in 37 countries. In another recent newsletter email from the ECF they announced the work of the ECF's Helmet Working Group. The ECF Helmet Working Group is building this page to help ECF member organisations stop the dangerisation of cycling through helmet promotions and the threat of mandatory cycle helmet laws. Shock-horror helmet promotions are countering the good work of ECF members to promote cycling as a healthy and safe way to travel. They're still building their webpage, which can be found here. As cycling has many different aspects it should be an issue for many different sciences. In any case scientists who cycle themselves, who believe that people should cycle and who want to contribute to the promotion of cycling and to the improvement of cycling policy and the bicycle as a vehicle should be interested in the exchange of ideas, articles, research projects, reports etc. via a network of scientists for cycling.